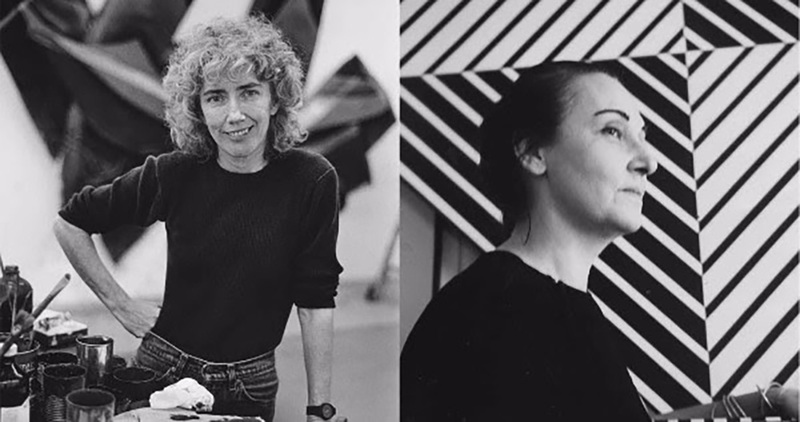 Elizabeth Murray and Carmen Herrera. Murray photographed by Barry Kornbluh. Courtesy of Taskovski Films. Herrera photograph courtesy of Ratpac Documentary Films. Film Forum will present the premieres of Kristi Zea’s hour long debut, Everybody knows…Elizabeth Murray, and Alison Klayman’s thirty minute short film, The 100 Years Show. The two films will debut in a ninety minute program on Wednesday, January 11th. Both productions feature the life of a female artist and are produced by female filmmakers, giving an accurate and feminine focus on the life and works of two extraordinary artists. Everybody knows…Elizabeth Murray is Zea’s debut film documentary. 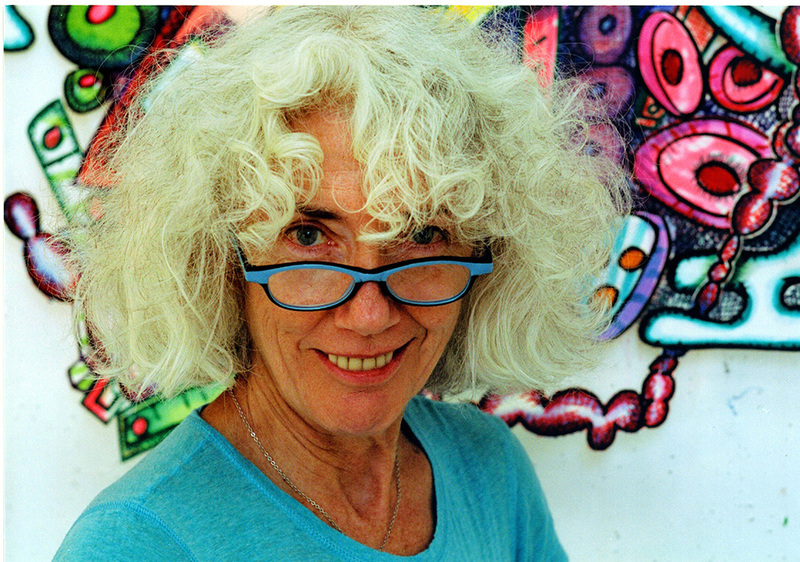 Zea has served as a costume designer and award-winning production designer for Martin Scorsese and Jonathan Demme and brings this experience to her documentary on the life of artist Elizabeth Murray. Murray is known for her themes of color and shape that preside in nearly all her pieces. She spent her forty year career establishing herself as one of the most well known and female celebrated artists and had exhibits at the Whitney Museum of American Art, Solomon R. Guggenheim Museum. She also was the fifth women to be honored with a retrospective at the Museum of Modern Art. The documentary explores Murray’s personal life and groundbreaking career and features Meryl Streep reading Murray’s journals and work testimonials by Roberta Smith, Paula Cooper, Jennifer Bartlett, and Vija Celmins. Murray’s work is currently on view at CANADA (333 Broome Street, NYC) now through January 29th in an exhibit curated by Carroll Dunham & Dan Nadel. Carmen Herrera, photo by Erik Madigan Heck. Courtesy of Ratpac Documentary Films. 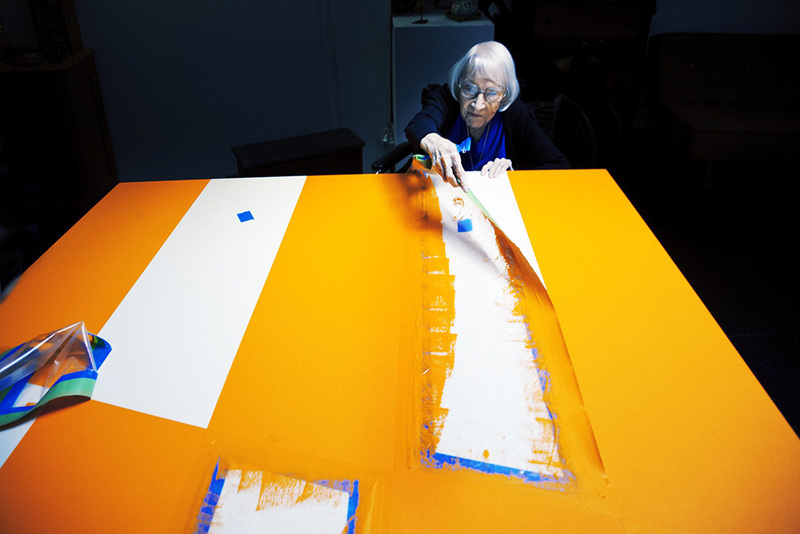 Carmen Herrera’s life is depicted in Klayman’s The 100 Years Show. At 101 years old, Herrera is Most likely the oldest working artist in the United States of America. Born in Havana, and living in New York City since 1954, Herrera has seen the growth and changes in art in The United States. Herrera is known for her abstract, minimalist paintings that have been shown at the Museum of Modern Art, The Tate Modern in London, The Walker center in Minneapolis, and the Hirshhorn Museum in Washington DC. In the documentary, Klayman uses her impressive film making background to translate Herrera’s life through tape. Klayman’s debut documentary, Never Sorry earned the title of the highest grossing film of 2012 directed by a woman. The 100 Years Show has gathered five-time-winner for best documentary from Ashland independant Film Festival, Heartland Film Festival, Riverrun International Film Festival, Ozark Footthills Filmfest, and Docutah International Film Festival. Herrera currently has a solo art exhibit now until January 9th at the Whitney Museum.